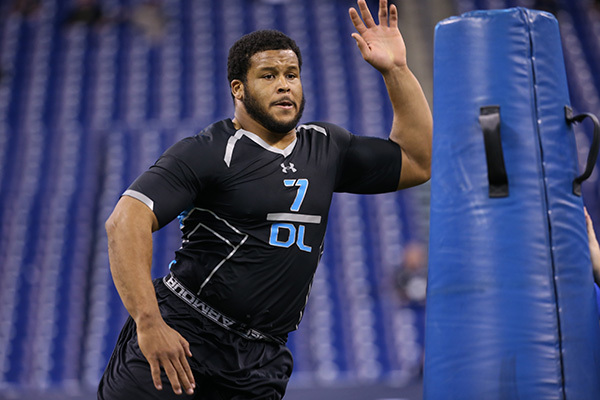 Aaron Donald looked very good at the NFL Combine. He is likely the first defensive tackle taken in this year’s NFL draft. The 2014 NFL Combine is now in the books. We will give recaps of the players that made money by improving their draft stock. Today we move on to day three of the Combine when the defensive line and linebackers were on display. The first group to compete on day three were the defensive linemen. I’ve always been a believer that teams should be built starting with the line. On offense, you have to have a good line to open holes for the running game and protect the passer. On defense, you need players that can stop the run and even more important put pressure on the opposing quarterback. Defensive linemen that can only play against the run may only be on the field on 1st down (or maybe not at all). Regardless of the defensive scheme, having defensive linemen that are disruptive make things more difficult for an offense. You hear all the time that the NFL is passing league and having guys that can put pressure on the quarterback make it more difficult to move the ball. Jadeveon Clowney – S. Carolina – DE – (6-5 266 lbs. ): Freakishly athletic. Long, lean and fast. Did not participate in on-field drills. Had unbelievable measureables. There is no question about his athleticism and his ability to dominate games. The question on him is his motor. Ran an unbelievable 4.53 40 (top DL). Showed good lower body explosion by broad jumping 10’4” (#2 DL) and 37.5 vertical jump (#2 DL). Scott Crichton – Oregon State – DE – (6-3 273 lbs. ): Likely a 4-3 defensive end with a high motor. Strong at the point of attack. Long arms to keep offensive linemen off of him. Explodes off the line at the snap. Might be a good fit as a left defensive end in a 4-3 scheme. Participated in linebacker drills, but looks better with his hand on the ground. Aaron Donald – Pitt – DT- (6-1 285 lbs. ): Had a very good day and stood out as the top defensive tackle at the Combine. Quick and fast defensive tackle that is a great fit as a 3 technique in a 4-3 scheme. A very strong player that uses his hands well. Plays with good leverage. Very fast for a man his size. Ran a 4.68 40 (#5 DL) and a 7.11 3 cone drill (#4 DL). Had 32 reps on the bench press (#2 DL). Kony Ealy – Missouri – DE – (6-4 273 lbs. ): Versatile defensive end that does a good job putting pressure on the quarterback. Participated in linebacker drills, but looked better as a defensive end. Has good flexibility and shoulder dip when rushing the passer. Has a good spin move that allows him to separate from blockers. Ran a 4.92 40 yard dash, so he may not have the foot speed to play linebacker, but he gets off the ball quickly from a 3 point stance. Ra’Shede Hageman – Minnesota – DT- (6-6 310 lbs. ): Big, tall defensive tackle that looks lean for his size. Very fluid athlete that is a former tight end. Has good ability to change directions. At times plays too high. Could be a 3 technique in a 4-3 scheme, but also has the body length and long arms that would be a good fit as a 3-4 defensive end. Needs to be more consistent. At times dominates games, but at other times he disappears. A very raw player that may need time to develop. Had 32 bench press reps (tied for #3 DL). Jackson Jeffcoat – Texas – DE – (6-3 247 lbs. ): Defensive Player of the Year in the Big-12. Son of former Cowboys DE Jim Jeffcoat. Small for a defensive end, but looked stiff in linebacker drills. Needs to develop strength to compete against the run. Likely a situational pass rushing defensive end until he can develop strength and put on the weight required to hold up as a full time defensive end. Timmy Jernigan – Florida State – DT – (6-2 299 lbs. ): Stout at the point of attack. Could play as a nose tackle or 3 technique. Good motor. Has loose hips and changes direction very well. Good knee bend and plays with good leverage. Has the ability to be disruptive. Has the strength to occupy blockers and tie up the middle of the line. Anthony Johnson – LSU – DT – (6-2 308 lbs. ): Quick in tight spaces. Moves well. Has strong, heavy hands. At times plays too high and needs to show consistent productivity. Looked good in on field drills, so the talent is there. Howard Jones – Shepherd – DE/OLB (6-2 235 lbs. ): Worked out with the defensive linemen, but also participated in linebacker drills. Due to his size and speed, 3-4 teams will likely be interested in him as an outside linebacker. Good flexibility and shoulder dip. Has long arms and is extremely athletic. Good balance and body control. Tested very well. Ran a 4.60 40 yard dash (#3 DL) and 7.16 3 cone drill (#5 DL). Had a 40.5 vertical jump (5th best at the Combine) and 10’4” broad jump (tied for #2 DL). Demarcus Lawrence – Boise State – DE/OLB (6-3 251 lbs. ): Very smooth athlete. Participated in linebacker drills and looked very good. Very good balance and body control. Natural pass rusher with good pass rushing technique. Has the flexibility you like to see in outstanding pass rushers. Has long arms that keep blockers away from him. Disruptive playmaker. Louis Nix III – Notre Dame – DT (6-2 331 lbs. ): Prototypical nose tackle. Lost 20 lbs since the end of the season. Quick in short areas. Very powerful. Decent feet for a man his size. The big question on him is his conditioning. Michael Sam – Missouri – DE – (6-2 261 lbs. ): Tweener that has the size of a linebacker but has the skill set of a defensive end. May not have the size to hold up to a lot of snaps at DE. Participated in LB drills, but didn’t look athletic enough to play the position. Has stiff hips. Will likely be a situational pass rushing defensive end in the NFL. Chris Smith – Arkansas – DE/OLB (6-1 266 lbs. ): Smooth, fluid athlete. Versatile. Very quick off the ball. High motor. Has raw pass rushing skills, relying on speed to beat blockers. Needs some work on technique, but has the physical skills to put pressure on the quarterback. Participated in linebacker drills and looked good. Flips his hips well. Marcus Smith – Louisville – DE/OLB – (6-3 251 lbs. ): Played defensive end, but has the movement skills to play linebacker. Quick off the ball. Good flexibility. Good balance and body control. Closes quickly on the quarterback. Has experience playing as a linebacker. With his size, he is likely a 3-4 linebacker at the next level. Ran a 4.68 40 yard dash (tied for #5 DL). Larry Webster – Bloomsburg – DE/OLB – (6-6 252 lbs. ): A small school player that is a former basketball player. NFL bloodlines (son of former NFL DT Larry Webster Jr.). Long and lean body type. Fluid athlete that participated in linebacker drills. Very good lower body explosion. Quick first step with good bend and hip flexibility. Due to his size, NFL teams may also be interested in developing him as a tight end. This entry was posted on March 14, 2014 by draftmaniacs in All-Star Games and Combine and tagged 2014 nfl combine, 2014 NFL draft, Aaron Donald, Howard Jones, Jadeveon Clowney, Kony Ealy, Larry Webster, Louis Nix III, Michael Sam, NFL, NFL Combine, NFL Draft, Ra'Shede Hageman, Timmy Jernigan.